The Rosary Shrine is home to a “relic image” of Our Lady of Guadalupe, that is, a replica of the miraculous tilma of St Juan Diego, obtained from the Guadalupe Basilica in Mexico City and touched to the original tilma; this was installed by the Apostolic Nuncio at a Solemn Mass on the feast of Our Lady of Guadalupe in 2017. Since then, every month, on the first Saturday, there is a Pro-Life Mass celebrated in the Rosary Shrine, followed by devotions and prayers to our Lady of Guadalupe as Patroness of the Unborn Child, and Protectress of the Pro-Life Movement. 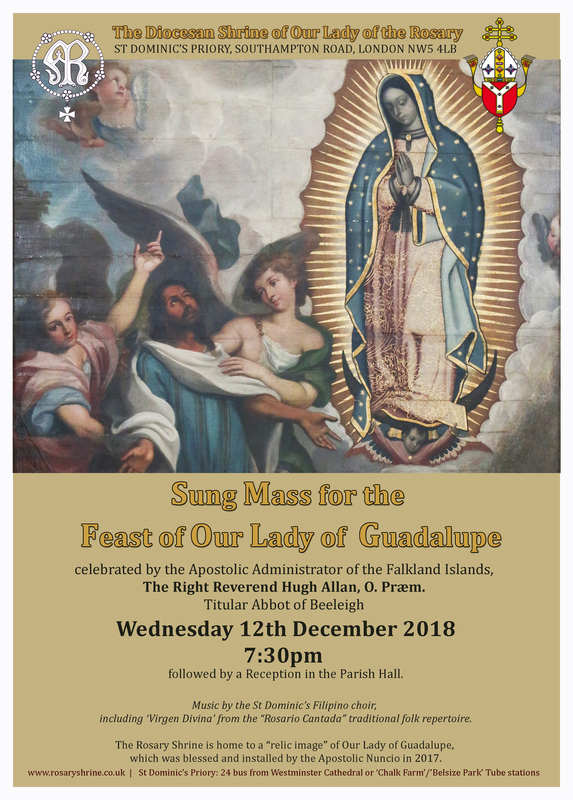 This year, on 12th December, the feast of Our Lady of Guadalupe, the Rosary Shrine welcomes the Norbertine Abbot Hugh Allan, who will celebrate the annual Guadalupe Mass and preach. The Mass begins at 7:30pm, and will be sung by the Filipino choir. Among the musical pieces they will sing are some Marian songs from the uniquely Hispano-Filipino folk music that forms part of the ‘Rosario Cantada’ tradition. We warmly invite you to this Mass in honour of the Empress of the Americas, Patroness of the Philippine Islands, and the Star of the New Evangelization! Viva la virgen de Guadalupe!